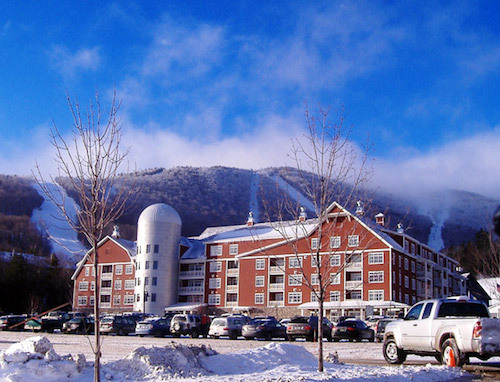 Vermont has 20 alpine ski resorts. And though each has its own particular charm, one of my favorites is Sugarbush. 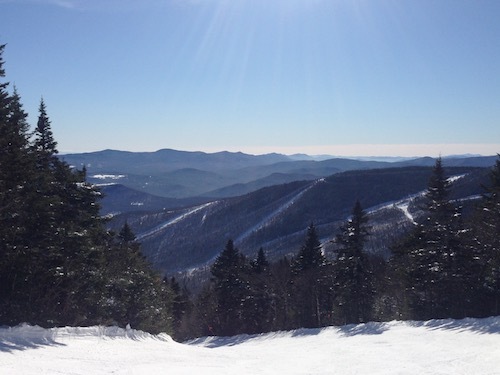 Located in the Mad River Valley, a beautiful region in an especially beautiful state, Sugarbush consists of two main peaks: Lincoln Peak (3,975 elevation, 2,400 vertical) and Mount Ellen (4,083 elevation, 2,600 vertical). Between the two is Slide Brook basin, a wilderness ski area made up of 1,000 acres. So what makes it so special? First, it strikes a great balance between being a skier’s mountain and a family destination. There’s plenty of expert terrain — more than 40% of the mountain is rated black diamond — but there’s enough to keep intermediates and beginners happy. Instead of the broad groomers that make one mountain pretty interchangeable from the next, Sugarbush has terrain with character. There are lots of the traditional, winding New England trails that offer a surprise around every bend. There’s plenty of tree skiing and bumps. And there are spectacular views; look one way, and the Green Mountains stretch out before you; the other, Lake Champlain. What’s more, Sugarbush has what can only be defined as a Vermont vibe. It’s as if the place was weaned on maple syrup. And yes, it makes a difference in the atmosphere. This past week I had the pleasure of spending a few days at the mountain’s Women’s Discovery Camp. Sugarbush ran two of these this season: one over a weekend in January, and one during the week in early March. So let’s cut to the chase: Was it good? Would I recommend it? An emphatic yes to both. 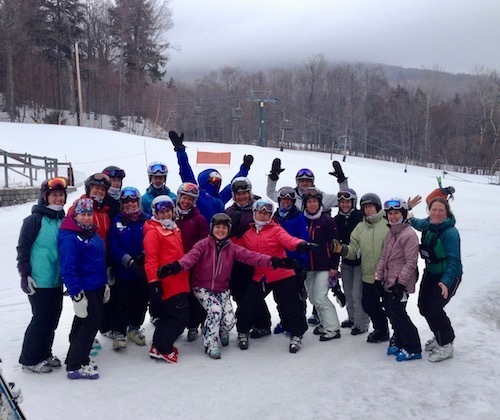 I’ve attended a few women’s clinics over the years, and I liked what I saw at Sugarbush. Maybe it’s because it has a history. Meredith told me that the clinic at Sugarbush goes back at least 25 years. Although the focus was initially more social than instructional, it evolved over the years to the shape it’s in today. 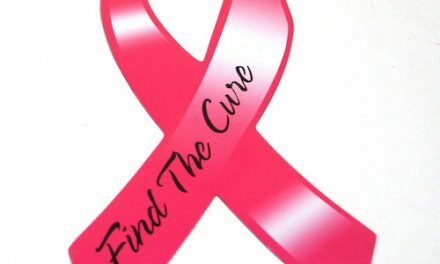 • Great student/instructor ratio: The clinic I attended had 13 women attendees, the one in January, 20. In general, there’s a 6:1 student/instructor ratio (though my group was 4:1). 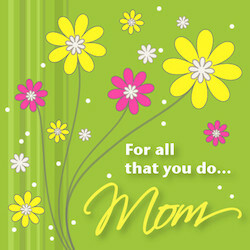 Which means you get a lot of individual attention and feedback. • First rate female instructors: Make no mistake, these women are top notch. My instructor, Lisa Segal, is an L-3 PSIA Examiner. In case you don’t now, this is as high as you can go in the instructor hierarchy. It requires a massive amount of training and expertise. And it showed. 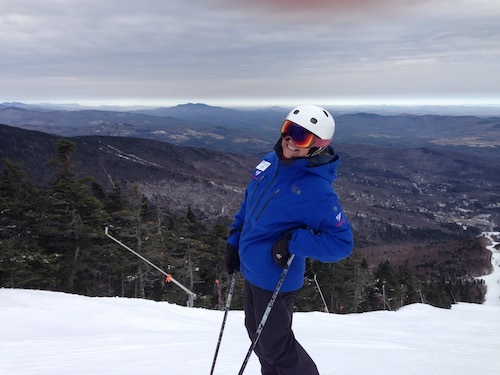 PSIA Examiner, and my instructor, Lisa Segal. • The terrain: I described Sugarbush’s terrain at the beginning of this piece, and the variety makes it perfect for a learning situation. You get to try new skills in a lot of different situations. • Off slope learning: The first morning of the clinic, we had an address by Terry Barbour, Sugarbush’s Ski School Director. Terry discussed the importance of proper stance along with the uses of edging and turn shape, and took us through a few off-slope drills. Later that day, there was a presentation about new skis. 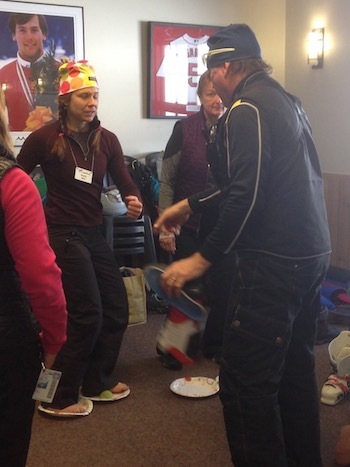 And the next day, a talk about ski boots. 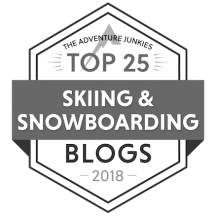 So a lot of good information about stuff skiers need to know. 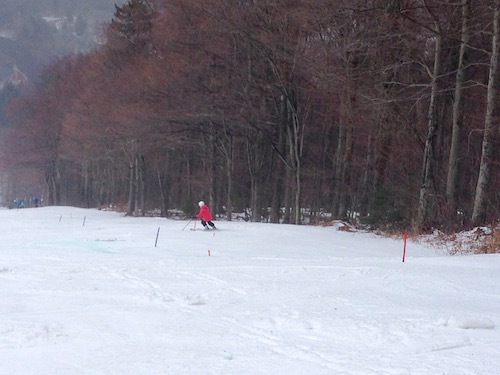 Ski School Director Terry Barbour explains rotation. • Sure it’s a learning experience. But if sure feels like fun! That’s because everyone associated with it — the instructors, the staff — did their best to make this a low pressure, highly enjoyable environment. Let’s face it: we’re not trying out for the US Ski Team. The idea behind this is to not only make you a better, more confident skier but to amp up the fun factor. And they do. • Ski demos: If you want to try new skis, you can. Demoing is a great way to figure out if a particular ski is right for you before you plunk down your hard-earned cash, and Sugarbush had a variety of skis available free to clinic attendees. Usually, you have to pay to demo. So this was an added plus. • Running gates: OMG this was so much fun! I’m not a racer, so I’ve never had the opportunity to run gates before (full disclosure: these were stubbies). But it gave you a feel for what it was like. And it helped us with our turns. • Videotape analysis: This is pretty standard in any good clinic. Nonetheless, it’d been a loooong time since I’d been taped. And yeah, it’s an eye opener to see how you really ski, particularly when it’s slowed down for frame-by-frame examination. A good way to find out what you’re doing wrong — and right! 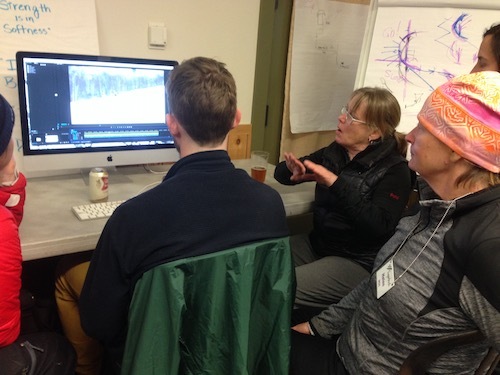 An instructor takes an attendee through videotape analysis. • Yoga: We had the option of starting each day with a yoga workout, something I took advantage of. And why not? Yoga gets your body ready and engaged for skiing. Plus it’s just good for your all around health. 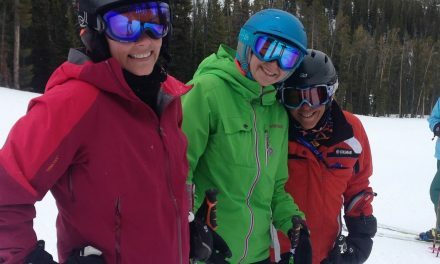 • What I really like about the camp is how it not only helps engender a love of skiing, but also helps foster friendships that last. This is the third one of these I’ve attended at Sugarbush. And though the chemistry of each is different, they’ve all been fantastic. • I love the low pressure environment. Sure, I’m here to learn, but I don’t feel the anxiety that I’ve found in a mixed group. The instructors really know what they’re doing. They’re so supportive. And they make it so much fun! • I came to improve my skiing and I found a community, and every time I come back, I refind that community. And then there’s the hotel…..
One of the great things about doing the clinic was staying in the fabulous Clay Brook Hotel, just steps away from the lodge at the base of the mountain (can you say pampered?). 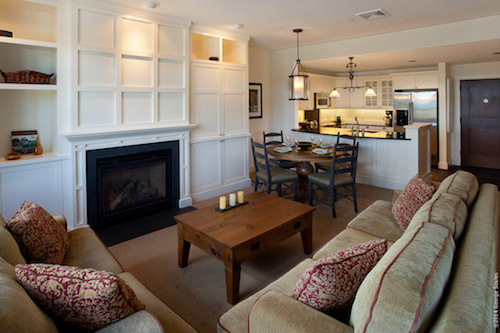 Opened in December, 2006, the hotel has accommodations ranging from studios to five bedroom suites. I stayed in a one bedroom unit, which consisted of a full-sized, completely outfitted kitchen, a living room/dining area with a gas fireplace, a bedroom with a Queen-sized canopy bed, and a bathroom featuring a huge jetted tub. It even had a washer/dryer to take care of dirty ski clothes. If you want to soak out the kinks after your day, you can relax in the hotel’s heated pool or hot tub. Or if you don’t get enough of a work out on the slopes, there’s a fitness center, too. All my interactions with the staff were extremely pleasant. For example, check in was a snap. They valet your car, unload your gear, and take your skis and boots to the respective ski and boot valets where they’re conveniently stored until you need them again. As for check out: I wanted to ski before I left, so they even put my bags in my car, where they were waiting when my vehicle was brought around at the end of my stay. Here’s a file photo of the hotel. 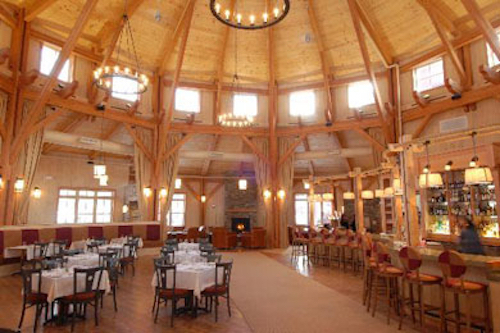 I love the Vermont barn-influenced design. It was awfully nice to relax in this place at the end of a busy ski day. Truly, I felt like I was in the lap of luxury. Sugarbush has a great thing going. Granted, it’s probably not for those of you who are thinking about trying out for the US Ski Team. 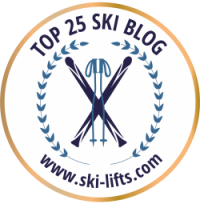 But for the recreational skier who wants to improve their skiing, increase their confidence and have a hell of a good time, it’s definitely worth doing.